This management agreement is for the management of a portfolio of net leased commercial real estate properties spread across several states. The manager appointed in the agreement has detailed responsibilities, and will be compensated by receipt of a percentage of the "gross income" of the properties. Owner is the owner of commercial real property located throughout the continental United States (hereinafter referred to collectively as the "Premises"). Manager has the experience and staff necessary and suitable for the management and operation of real estate properties in the United States and desires to undertake the management and operation of the real estate properties of Owner. Manager is an independent contractor and Owner shall have no voice in the selection or discharge of Manager's servants, representatives, or sub-contractors, or in their number or in the compensation to be received by them or in the period of hours of their employment, and no control over the specific manner in which the work shall be done, but Manager shall be responsible for the quality of work done and of the materials furnished, and warrants that they shall conform to the terms of this Agreement. Owner does hereby designate Manager the exclusive manager of all of Owner's real estate interests for the term of one (1) year commencing on the effective date hereof. This designation shall be automatically renewed annually on each anniversary of the effective date hereof for an additional one (1) year period, subject to the right of either party to cancel this Agreement at any time by giving the other party not less than thirty (30) days written notice of its intention to so terminate. Manager shall serve as an independent contractor, as Owner's sole and exclusive agent for the management of the Premises. Both parties acknowledge that certain individual properties owned by Owner are presently operated pursuant to "net leases" and other similar arrangements with third parties. These individual properties will not be covered by this Agreement until any such net leases are terminated, at which time operation of these properties shall be turned over to Manager pursuant to this Agreement. Owner and Manager agree, upon the request of either party at any time during the term of this Agreement, to acknowledge a schedule of properties covered hereby, including the legal description thereof if desired. A. Use its best efforts to lease and keep leased to desirable tenants all space held for lease. Manager shall lease the Premises with each lease identifying Owner (or the trade name of the Premises) as the title holder of the Premises and owner of the lease. Without the prior approval of Owner, no lease, including renewal options, shall exceed (i) one year for apartment leases, (ii) ten years for office or warehouse leases or (iii) twenty years for shopping center leases. In the event that a lease contract contemplated to be entered into by Manager in the name of the Owner is not within the limitations set forth in the preceding sentence, such lease contract shall be first subject to the written approval of Owner, which approval shall not be unreasonably withheld. 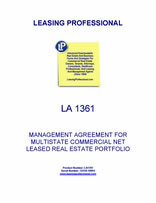 Manager shall advise Owner personally or by certified mail of any such proposed lease or amendment thereto. If Owner fails to advise Manager within ten (10) days after receipt of such notice, it shall be presumed that Owner granted Owner's written approval thereto and, accordingly, Manager shall be authorized to execute such lease contract in the name of Owner without being in violation of Manager's duties hereunder. All leases of the Premises shall remain the property of Owner and, regardless of their terms, copies shall be promptly provided to Owner. Manager shall have the right, without prior consent, at Owner's expense, to repair, alter, modify and improve (as distinguished from expansion) the existing structures, in connection with any such lease; prior approval, however, of Owner to be secured by Manager on all such matters involving costs in excess of ____________ Dollars ($_________) for any one item. Manager may collect from lessees, security deposits as deposits for the performance under the leases, the amount of such security deposits to be for such sum as is customary in the locality of said real estate. Failure by Manager to obtain any security deposit shall not constitute any nature of default by Manager hereunder. The security deposits, as collected, shall be paid over each month to Owner following the month of collection by Manager. The term "Agreement Year" as used herein shall mean the calendar year ending December 31st each year. The first Agreement Year shall be the period beginning on the date hereof and ending on the next December 31st, and the last Agreement Year shall be the period beginning January 1st of the last year of the term of this Agreement and ending with the last day of the term of this Agreement. Manager shall maintain, in a manner and form consistent with generally accepted methods of accounting, at its office, during each Agreement Year and retain such for a period of three (3) consecutive years thereafter, complete and accurate general books of account, which will reflect all receipts derived from the operation of the Premises by Manager during such Agreement Year, including but not limited to, original invoices, sales and other records pertaining to the business of operating the Premises and other pertinent papers and documents which will enable Owner to determine the gross receipts derived by Manager from the Premises. All of the aforementioned records shall be open to inspection and audit by Owner or its agents at all reasonable times during ordinary business hours. On termination of this Agreement, all records shall be delivered to Owner at the Premises. Owner and Manager recognize that Owner, itself, may have records pertaining to the Premises as to which Manager does not have actual knowledge; and nothing in this paragraph shall be interpreted to impose any duty on Manager with respect to such records or any other records of a type which would not be kept by a reasonably prudent business manager. Manager shall establish a bank account into which receipts relating to the Premises of the Owner transmitted to Manager or collected by Manager shall be deposited. From the funds in such bank account, Manager shall pay the following types of expenses associated with operation of the Premises (it being understood that nothing herein shall be interpreted to impose on Manager liability for the payment of any such expenses from Manager's own funds): on-site salary expenses of every kind and nature, utility charges, custodial service, management fees hereunder to Manager and all other recurring-type charges relating to the operation of the Premises (all of the aforesaid being herein sometimes referred to as "Premises Operating Expenses"). Manager shall submit to Owner on or before the tenth (10th) day of each month during the term hereof (including the tenth (10th) day of the month following the end of the term) at the place then fixed for the payments hereunder, a check in a sum equal to all funds in the bank account for the Premises except a nominal sum to pay obligations due prior to receipt of additional rentals, and a written statement, certified by Manager to be true and correct to the best of his knowledge and belief, showing in reasonably accurate detail, the amount of aforesaid receipts and the amount of Premises Operating Expenses disbursed from such bank account and the resulting difference for the preceding month accompanied by copies of invoices or statements paid, if applicable. Manager shall submit to the Owner on or before the thirtieth (30th) day following the end of each Agreement Year, at the place then fixed for payments, a complete statement of the aforesaid annual figures for the preceding Agreement Year in reasonable detail certified by Manager. Relative to the authority of Manager to pay from the bank account Premises Operating Expenses (as hereinabove referred to), such authority of Manager shall be limited as stated in subparagraph 4(C) hereof.